Untitled art fair takes place in a part of the world that will soon be underwater. On some level we all know this, but our failure to address or even really conceive of the problem speaks to a fundamental disconnect between mind and reality. Michael Zelehoski proposes to explore cognitive dissonance as it relates to the perception of an overwhelming issue like climate change by manipulating objects and materials that are a direct product of it. 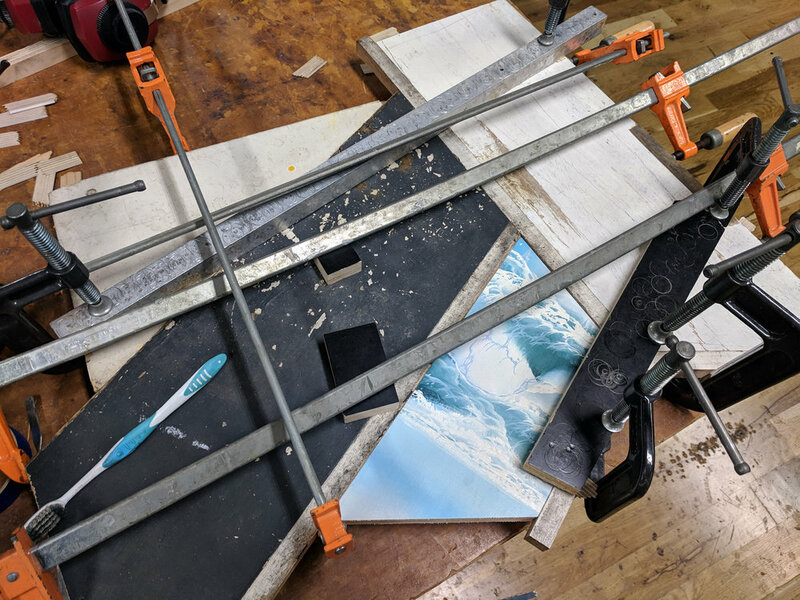 These objects, many of which were collected by the artist in Miami after hurricane Irma, become physical cyphers of this abstract phenomenon and challenge our understanding of perception and its limitations. Perception is an active and selective process that is intimately involved in thought and concept formation. Zelehoski explores this process on a physical plane by manipulating found objects in ways that resemble how they are recontextualized and abstracted by the mind. Objects, which are deconstructed and reassembled two-dimensionally, are activated by their reconfiguration and isolation in space. Our minds try in vain to reconstruct the fragmented objects, to coax them back into our own spatial continuity. In this way they function both as precept and concept and resemble our struggle to comprehend abstract issues like climate change. Just as looking forward in time involves an increasing distance of exchanges, so the composition of the booth employs a structure of increasing complexity. Time and space are represented by steel cable, employed as a graphic element that holds the compositional elements in check. On the left wall three lengths of tensed cable trace the two-dimensional coordinate of a room. 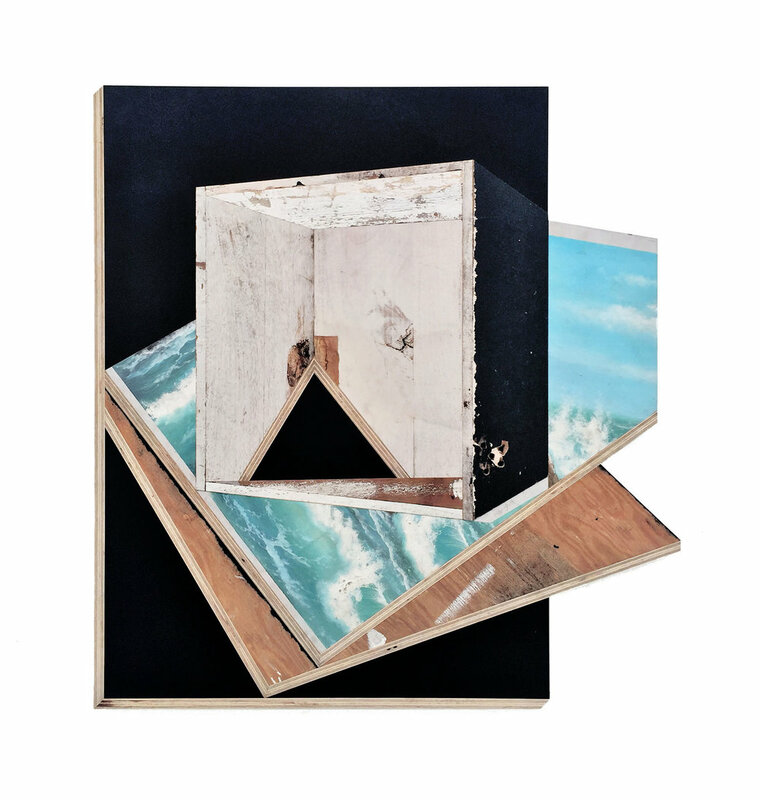 The works are in corresponding perspective and incorporate boxes, collapsed in space that pass through a blue plane that could as easily represent sea level as the limitations of our understanding. In the second wall, the cable framework becomes an autonomous cube - the third dimension. The cube is bisected by a weather ravaged plywood plane that seems to loom over the viewer as well as the broken benches at its base. The edge of a third piece is visible behind the plywood monolith but it, like the quadrate void on the plywood itself, is most notable for its obscurity. The third wall represents the fourth dimension - time. This construct goes beyond the scope of our three dimensional brains and as such, alludes to an outcome that is beyond our ability to comprehend. If art is a means of orientation, directed at understanding the world, ourselves and the complex relationships between them, it is not as fundamentally different from science as one might think. Hermann von Helmholtz argued that the processes underlying visual perception are generally similar to the inductive generalization employed in scientific reasoning. As science struggles to communicate its finding in a way that changes human behaviors, we as artists must expand our vocabulary.